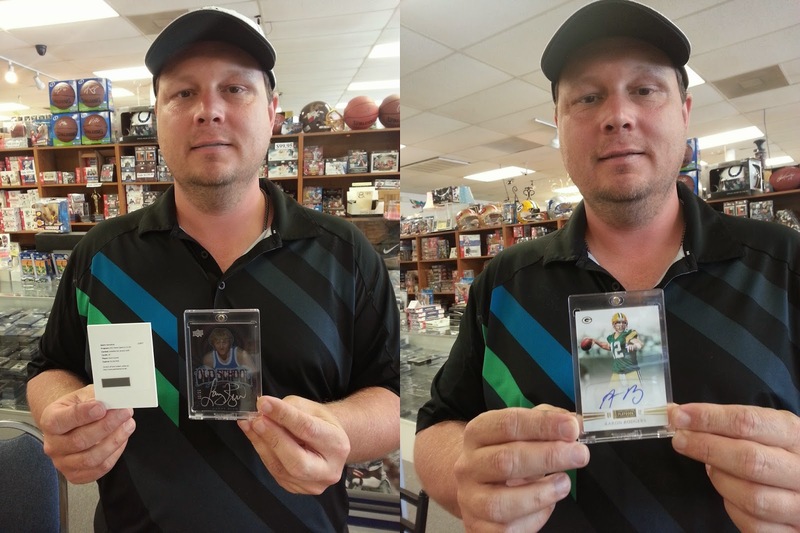 Beckett Grading will be at Sports Cards Plus to grade your cards IN-STORE and offer HUGE DISCOUNTS this Saturday (Sept. 13th) from 11 a.m. to 6 p.m. and Sunday (Sept. 14th) from 11 a.m. to 4 p.m. Here is your chance to turn your valuable cards into real treasures. Don't miss this opportunity. Need more great cards for Beckett Grading? You're in luck. Due in this Wednesday is 2013-14 Immaculate Basketball (pre-order price is $399.99). Immaculate Basketball is famous for its SICK Patches and amazing Autos. This year, Immaculate takes it to The Next Level with Game Used Shoe Cards which are going to be on everyone's wish list. If $399.99 is more than you want to spend, no problem. We will be conducting a 2013-14 Immaculate Basketball 6-Box CASE BREAK on Wednesday at 6:00 p.m. Slots are $85, with each slot randomly assigned one team. Your slot gets you all the cards from that 6-BOX CASE for your randomly assigned team. Catch it live on ustream.com on Wednesday at 6 O'Clock. Are you a Baseball fanatic? 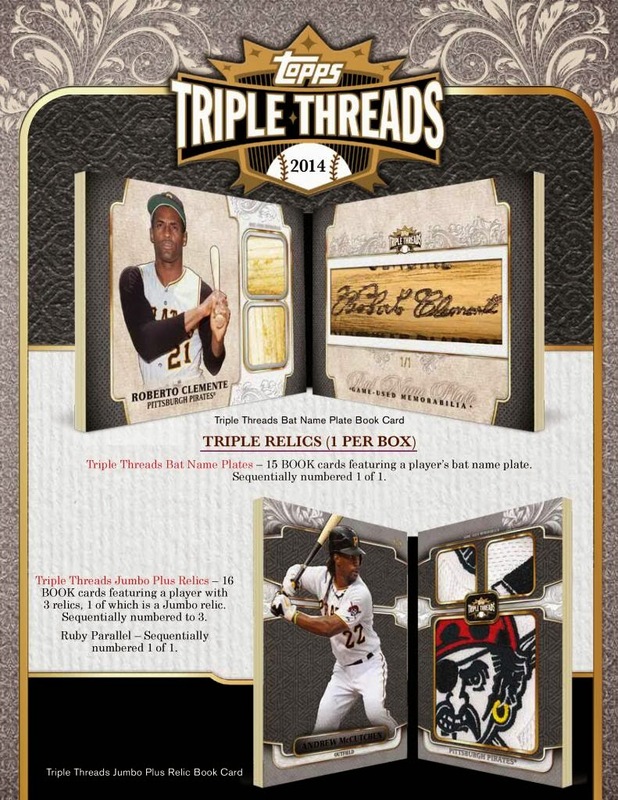 2014 Topps Triple Threads Baseball IS HERE with amazing auto Jersey Patch RCs and all your favorite veteran stars. Also included are autograph cuts and relics of Babe Ruth, Lou Gehrig, Honus Wagner, Roberto Clemente, Joe DiMaggio, and Ted Williams. Rob came in looking for more stuff for Beckett Grading. He never got a 1989 Upper Deck Ken Griffey Jr RC, so he bought a sealed 1989 Sealed Factory Set and pulled this beauty. Looks like a BGS 9.5 to me. Well, we'll find out Saturday. Benny has been working a lot lately and couldn't make it in to the Super Hit Factory. He asked me to pick a box with a Johnny Manziel Auto for him. I picked a box of 2014 Topps HTA JUMBO Football for only $99.99 per box. Here is Benny with his 2014 Topps 1963 Mini Johnny Manziel Auto #d/150. 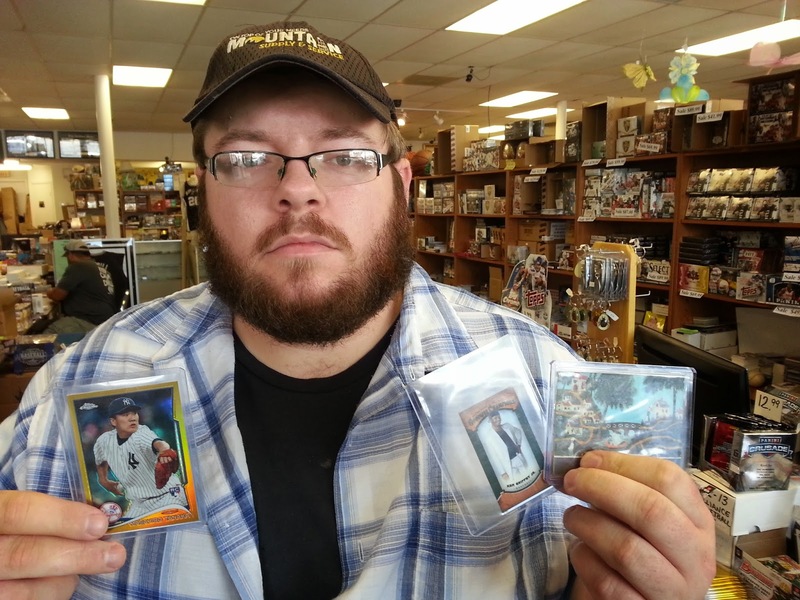 Ben is from Houston but he knows The BEST CASES in The Hobby are at Sports Cards Plus. Here is Ben with his 2014 Topps Inception Derek Carr Silver Ink Auto RC #d/25 and Jadeveon Clowney Auto RC #d/50. Nate came back for more Super Hits for Beckett Grading. He tried a box of 2013-14 Panini Spectra Basketball ($289) and pulled some great cards including this redemption for a Kevin Durant Auto Jersey GOLD #d/10. Next he tried 2013-14 UD Black Basketball ($199) and pulled a Larry Bird Old School Auto #d/25. Nate thought he was done when his eye caught 2011 Panini Playbook Football for only $115. 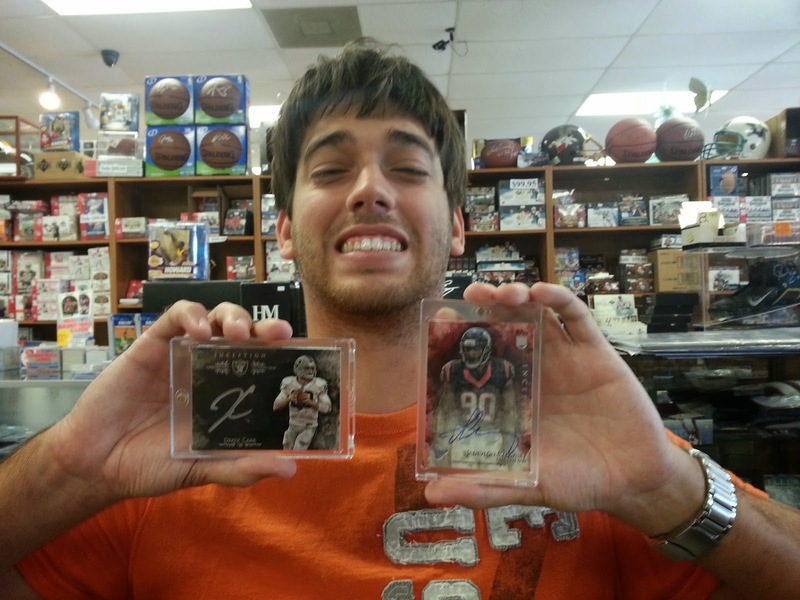 Here is Nate with his 2011 Playbook Aaron Rodgers On-Card Auto 3/5. Brandon came back and saw our last two boxes (Don't worry, more are due in Wednesday) of 2014 Panini Prizm Baseball for only $59.99. Here is Brandon with his Nolan Ryan Auto MOJO Die Cut Prizm Refractor #d/25. Moral of this story: The last boxes are HUGE boxes at The Super Hit Factory. Mike came in to try more 2013 Upper Deck Goodwin Champions. 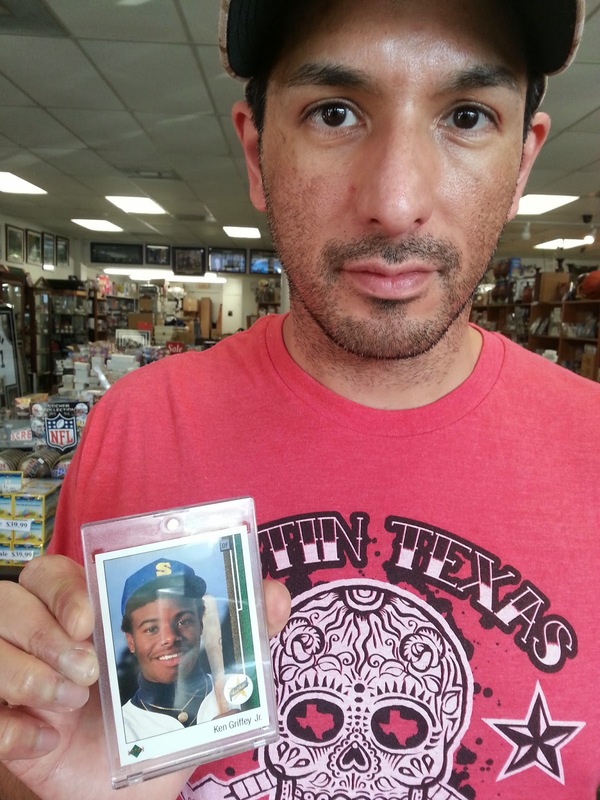 Here is Mike with his Ken Griffey Jr Mini Blank Back and 1/1 Original Art. Mike decided one great box deserves another. This time he tried a box of 2014 Topps Chrome Baseball. That's a Masahiro Tanaka Gold Refractor RC #d/50! James likes 2014 Leaf Best of Basketball. 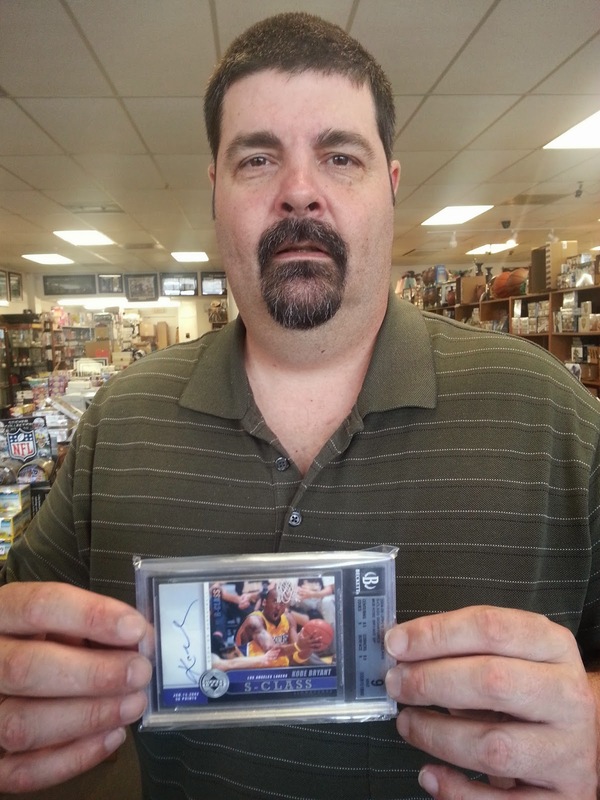 Here is James with his BGS 9 Kobe Bryant 2003-04 Upper Deck Rookie Class S-Class Auto. This card is so rare it is not listed in Beckett and only two have ever been graded by Beckett Grading. So, what are you waiting for? Come to Sports Cards Plus TODAY. Don't be the guy who says, "That could have been my picture." Pick your box from The BEST CASES in The Hobby at LOW, LOW, LOW Prices. And, at Sports Cards Plus you always get more. Come on in and have some fun.